A beveled diamond acrylic plate sits in a rosewood-finished base making an elegant and attractive award. 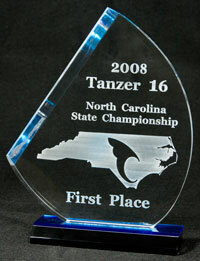 The diamond acrylic trophies are available in two sizes, 8" tall and 9.5" tall. Copyright © 2019 Little River Crafts.